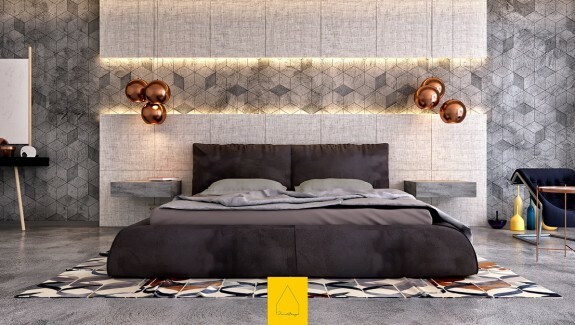 While concrete may not be the first thought that comes to mind for a traditionally warm and cozy bedroom environment, this material is far more aesthetically flexible than many would imagine. 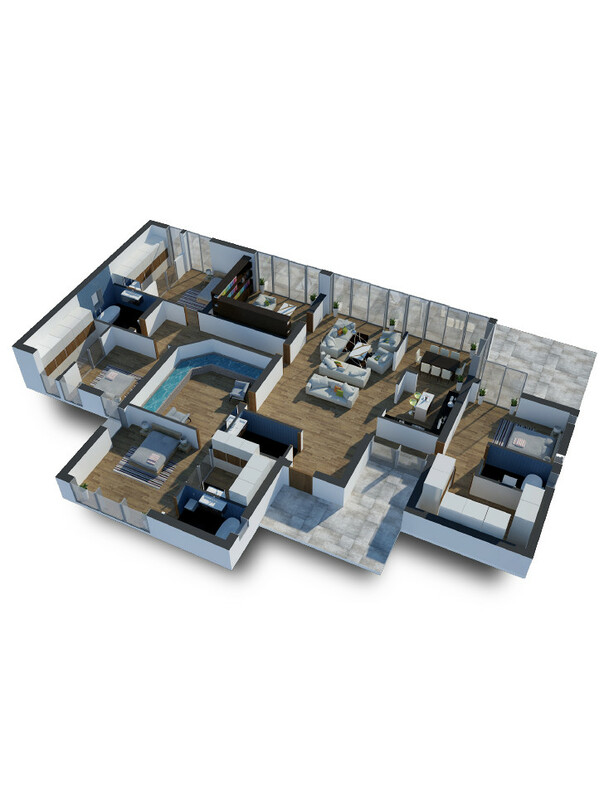 And the 30 bedrooms highlighted in this post are a great example! 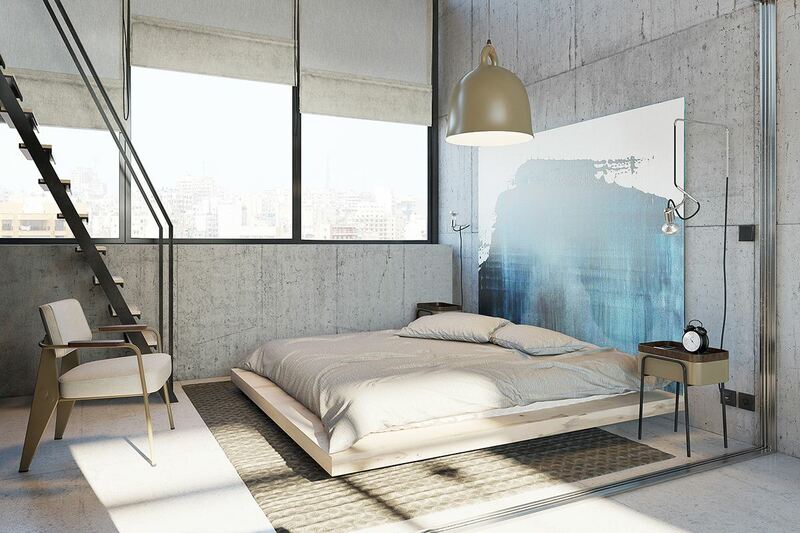 Ranging from minimalist to industrial, ultra-modern to eclectic, each of these bedrooms express a completely different personality through concrete. 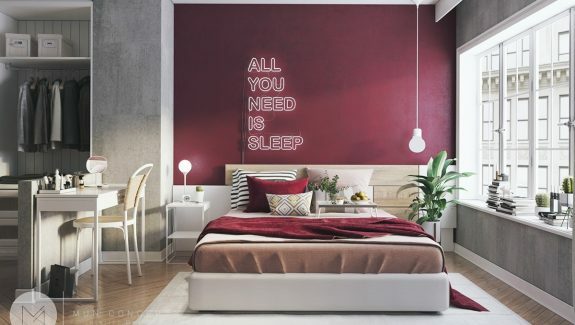 Have you been thinking about adding a bedroom accent wall or renovating for a more modern look? Check out these images for unique finishes and configurations to pull of the look. Let’s start with something out of the ordinary! 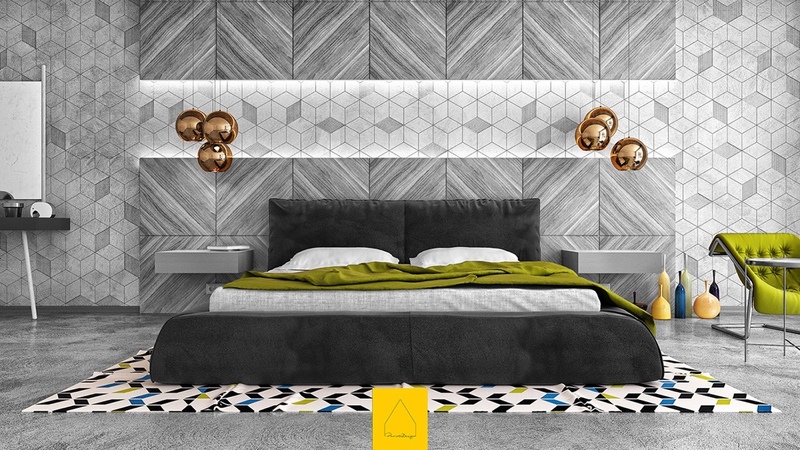 Two sturdy concrete pillars perfectly frame the bed and the gorgeous geometric mosaic that backs the headboard. Amazing! This material is unlike any other – translucent concrete gains its ethereal properties from embedded optical fibers that easily transmit light through an otherwise impenetrable material. 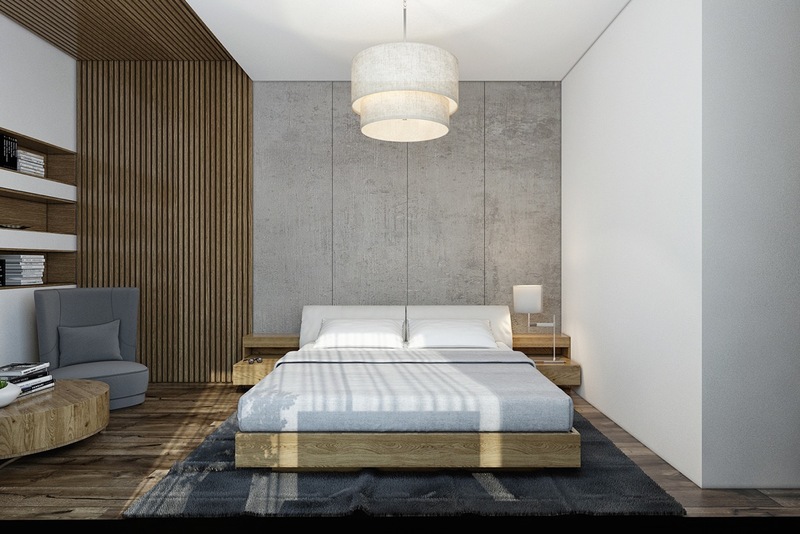 Here, brushed concrete captures the light of the nearby bedroom pendants to increase its warmth and textural appeal, all without departing from clean minimalism. 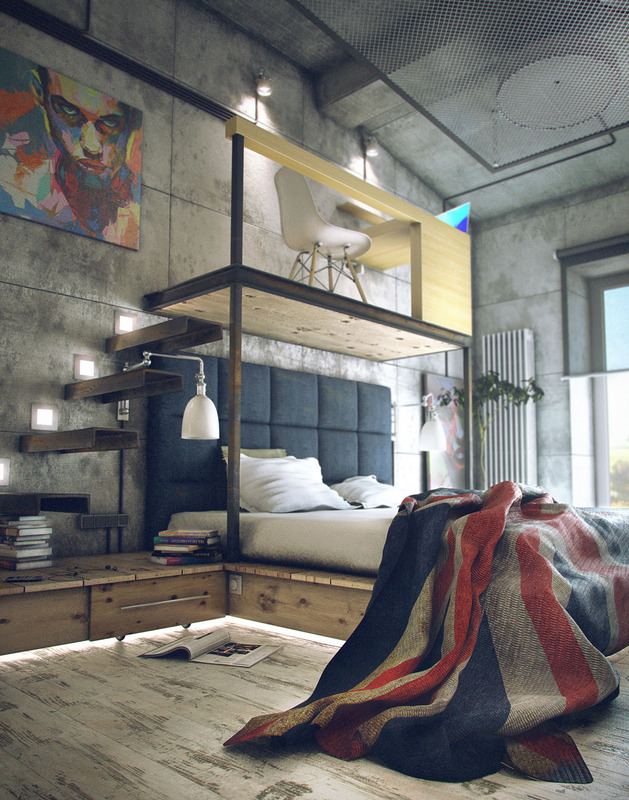 Bedrooms are rarely heavy on concrete but this one pulls it off fantastically. Roughhewn wood serves as an organic counterbalance and helps pull the outdoors in. 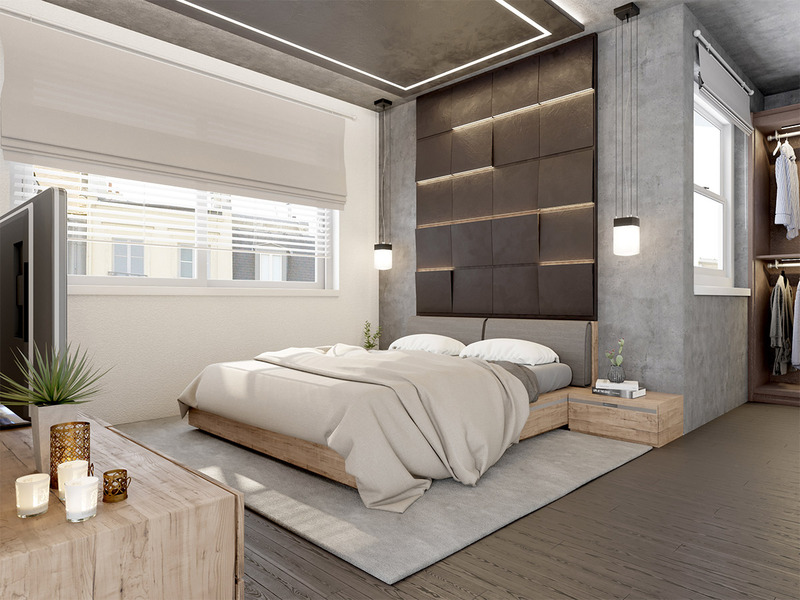 Wood and concrete again make a fabulous pairing in this handsome bedroom inspired by industrial decor. 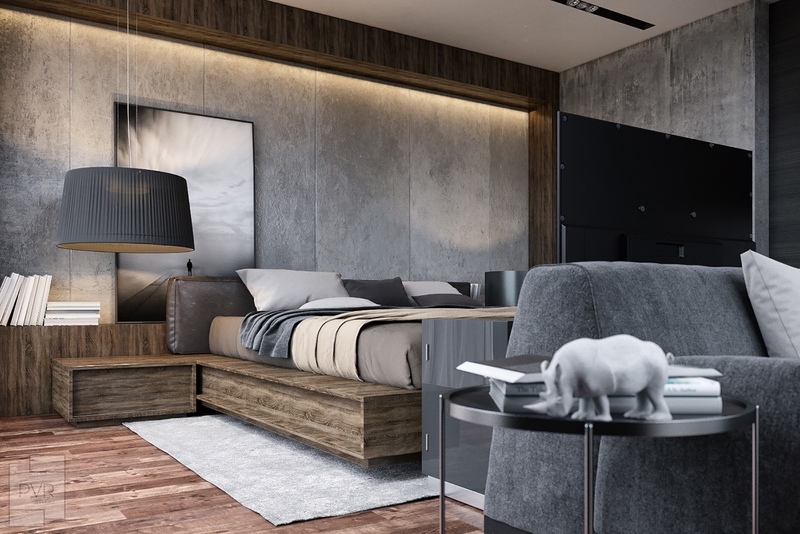 An oversized pendant and plush leather headboard introduce a hint of luxury to the composition. Concrete changes character depending on its material complements. The smooth texture and lightness of these wood details contribute to a purely contemporary look that strays from the roughness of the previous industrial themes. Even ordinary minimally finished concrete can make a big impression with a little smart embellishment. 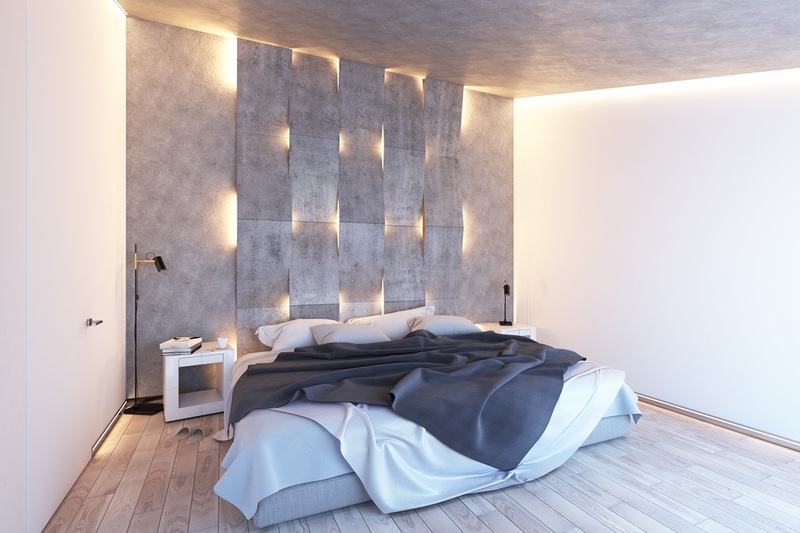 This accent wall includes a strip of integrated lighting to boost its appeal. Because concrete is often perceived as dark, harsh, or unwelcoming, lighting additions like these can make a world of difference. 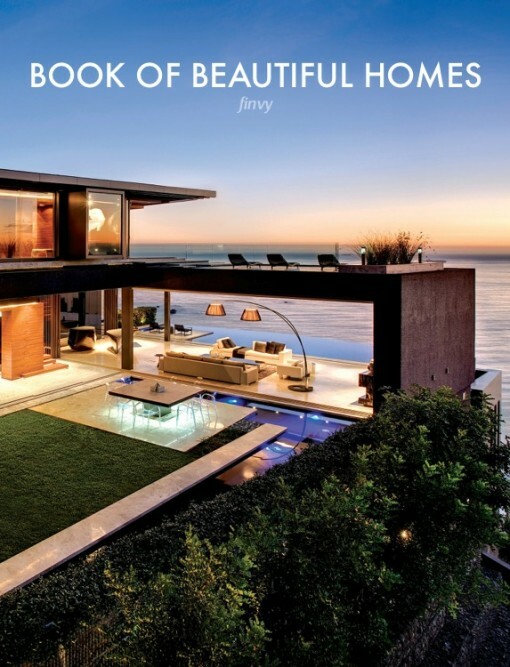 Of course, there are big ways to embellish concrete as well! A little stain and an artistic eye can transform this rigid material into a versatile canvas for expression. 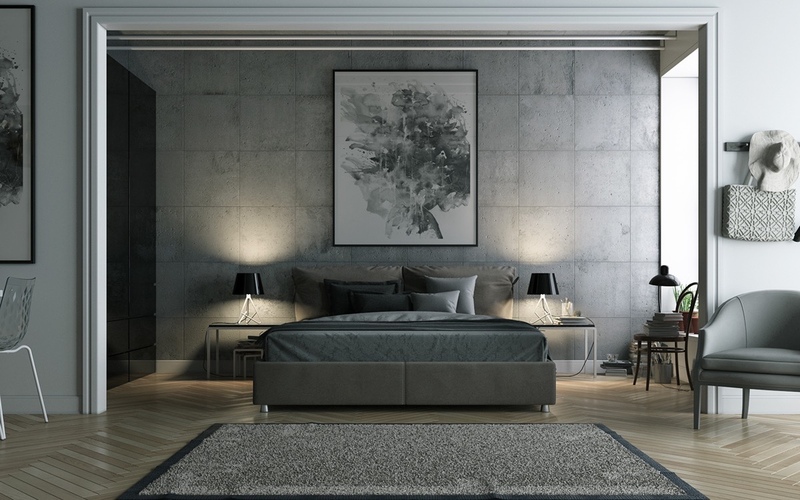 Another way that concrete excels is as a neutral backdrop for a dramatic focal point, like this dimpled wall panel. 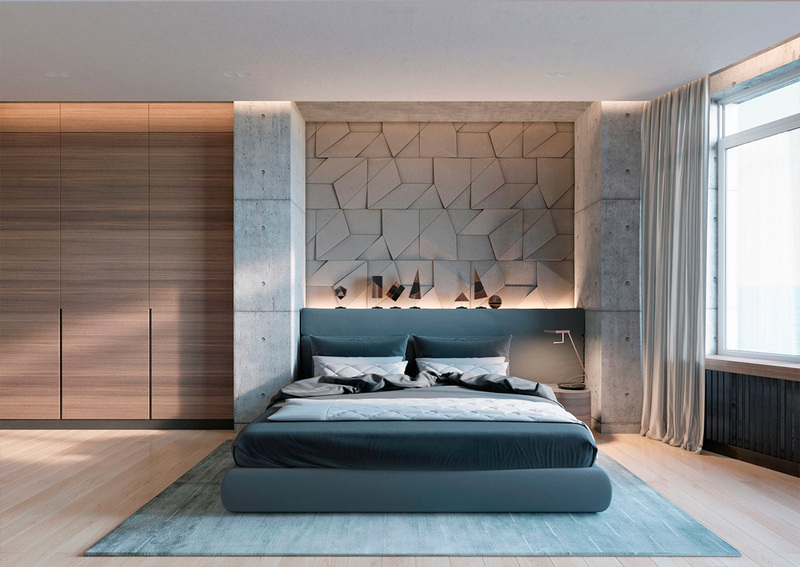 Tilted and lighted panels make up the headboard wall for this room. The entire surrounding structure is smoothed over with light concrete to avoid overwhelming the unique panel installation. 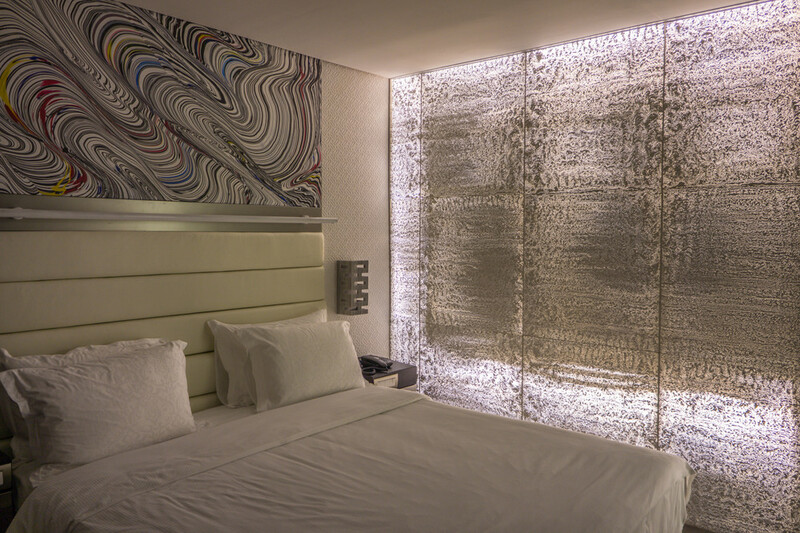 This panel installation uses a similar arrangement, but this time both surfaces feature a concrete texture. Do you love the integrated lighting? 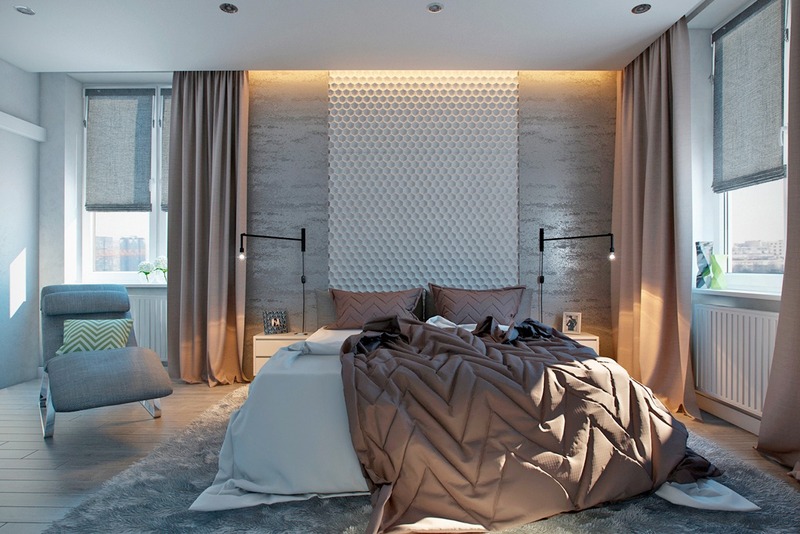 Check out our bedroom lighting ideas post for more inspiration! Artwork is another fantastic way to dress up a stark concrete finish. 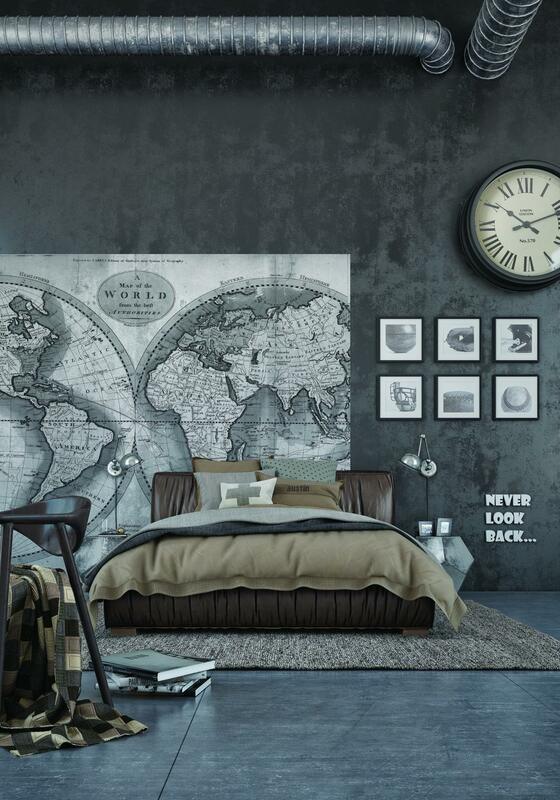 This neutral bedroom just wouldn’t be the same without the blue lighthouse prints hung above the bed. This print serves an important purpose by lightening an otherwise dark composition. 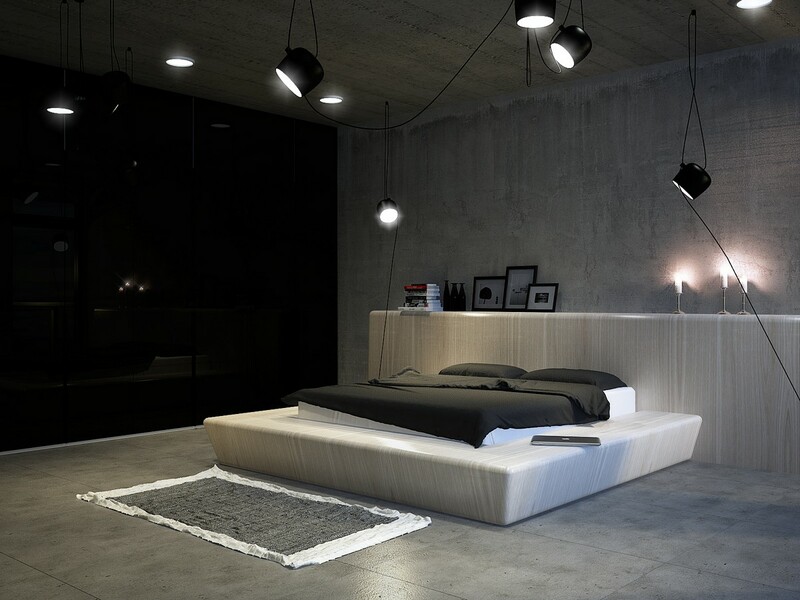 Mid-toned concrete adds depth to the bed’s niche while the white painting pushes outward and grabs attention. 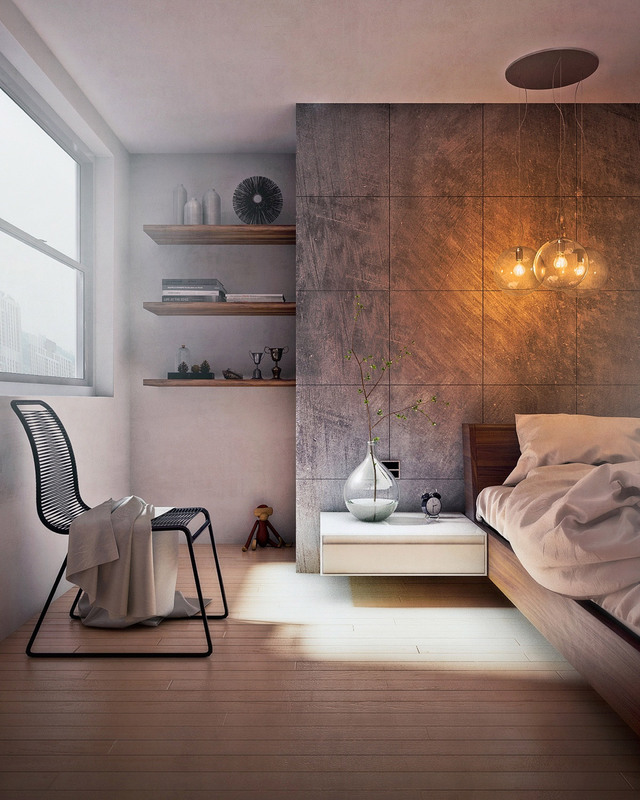 In a room defined by grey concrete, color becomes even more powerful as a decor tool. Artwork and architectural details blend into the background allowing furniture and accessories to shine brightly. Here’s another space where vivid color stands out. Check out our profile of this casual loft style home for more photos and information – the entire residence is worth exploring if you’re curious about a unique spin on industrial decor. Purple and blue soften the aesthetic of this bedroom with ease. Concrete has a reputation as a rugged material, but here its strength takes on richer nuances. 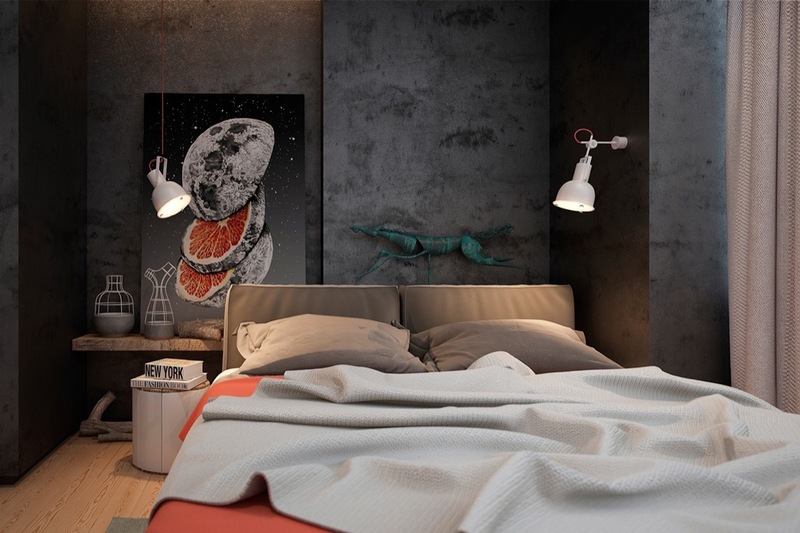 Darker concrete is a great backdrop for highly saturated colors like these tangerine orange accents. 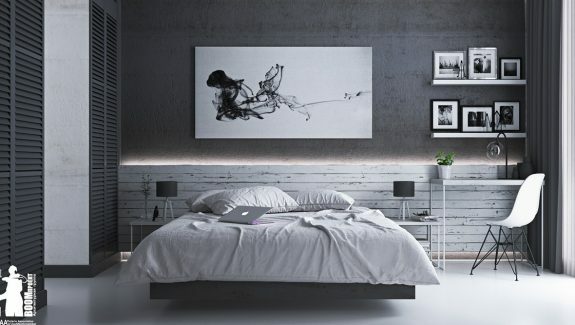 Now let’s look at a few different decor themes that lend themselves well (or even surprisingly well) to concrete walls. 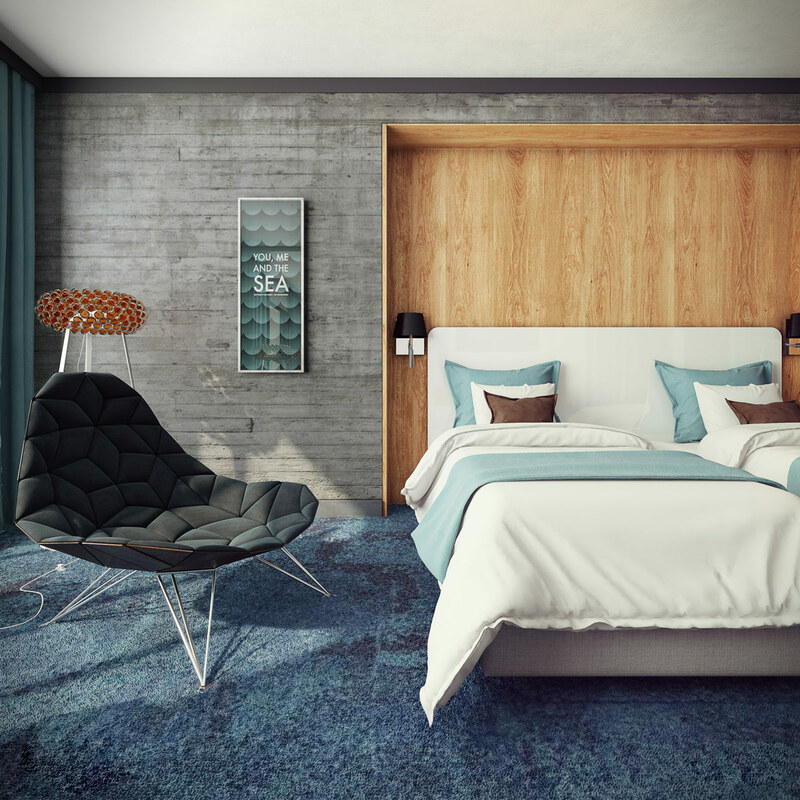 Minimalism is an obvious choice, as depicted in this bright and sunny bedroom. Gooseneck wall sconces leave a smaller footprint compared to bedside table lamps. 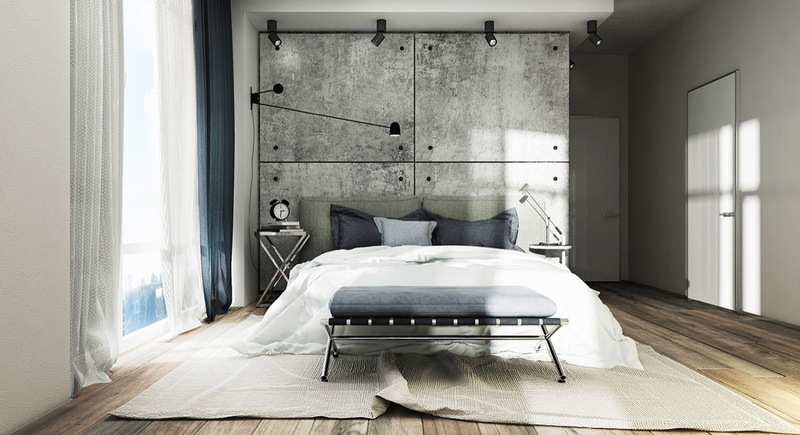 Concrete is a go-to for industrial themes as well. Concrete may set the scene but the textiles and prints set the mood where this strong industrial setting meets the whimsy of nautical decor. 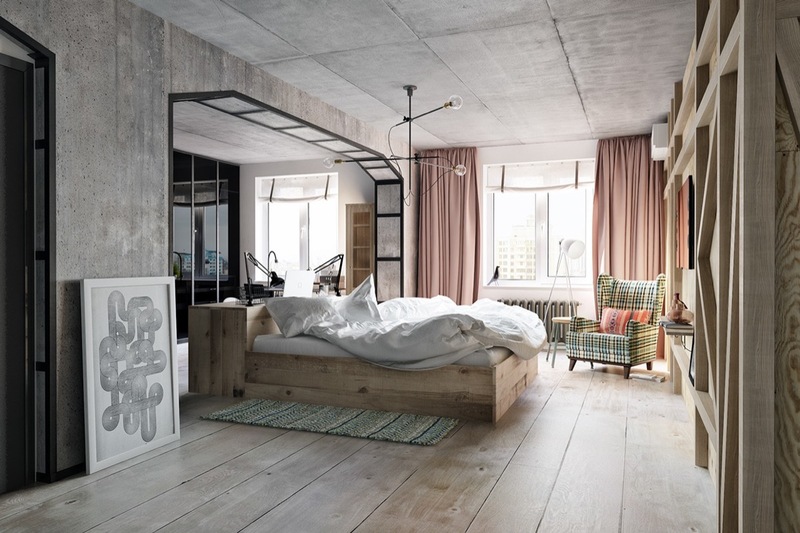 Low bed platforms are a popular choice for modernist bedrooms, especially the ones influenced by traditional Japanese and Korean design. 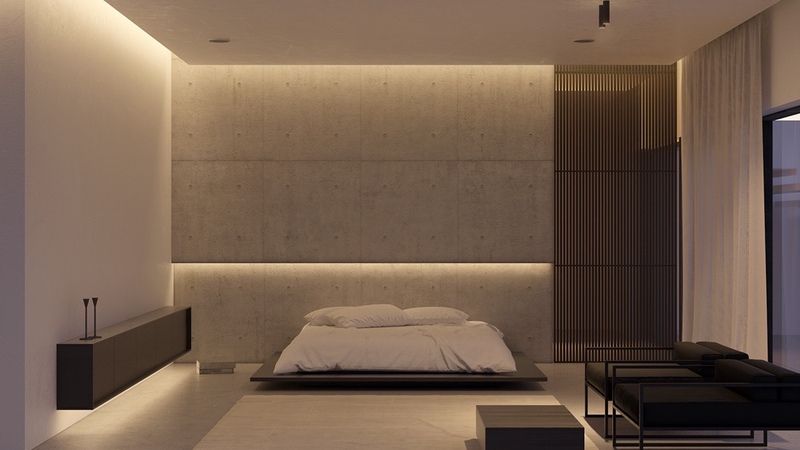 The contrast between modern design and traditional inspiration strikes quite a contrast in this fully concrete bedroom. 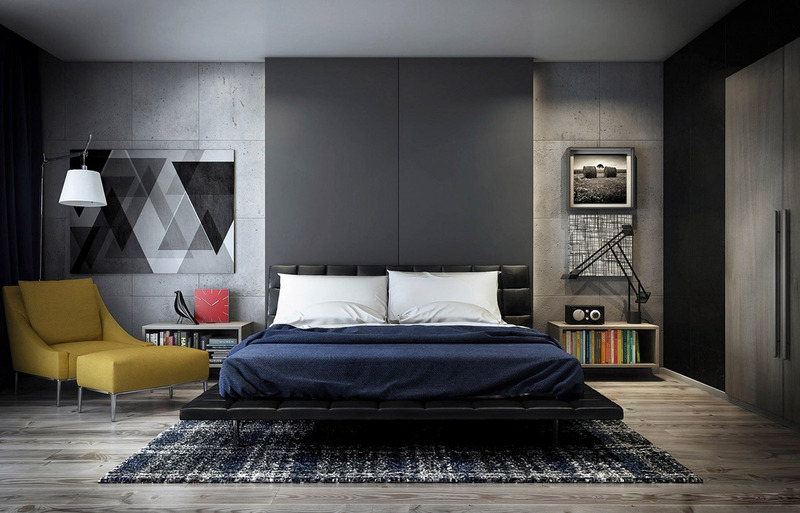 Here’s another interesting combination – modern concrete walls with vintage-inspired furniture. 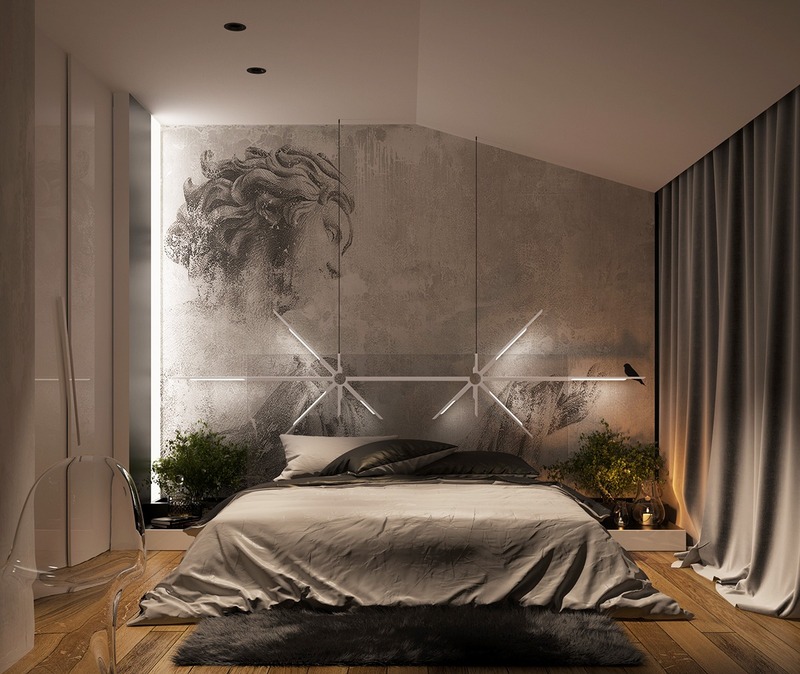 It also has a low-profile bed (perfect to show off the large artwork at the headboard) – if you’re interested in seeing more sleeping arrangements like this, check out our post dedicated entirely to bedrooms with low level beds. 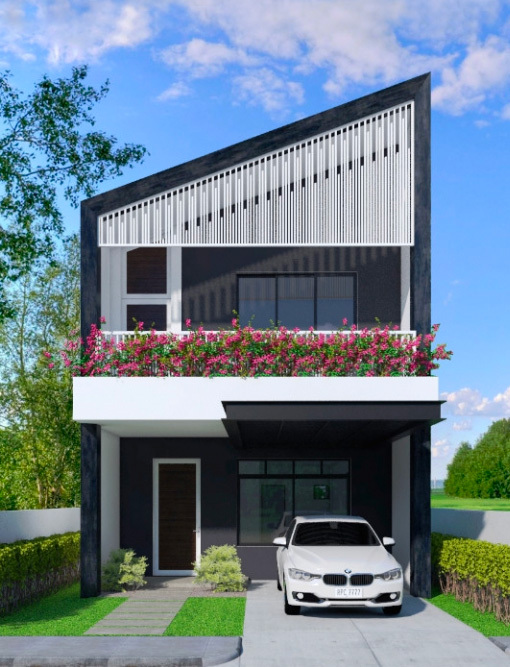 Geometric patterns have been a hot design statement in super-modern homes, Scandinavian-inspired homes, and a few other styles. These concrete tiles are a beautiful example. 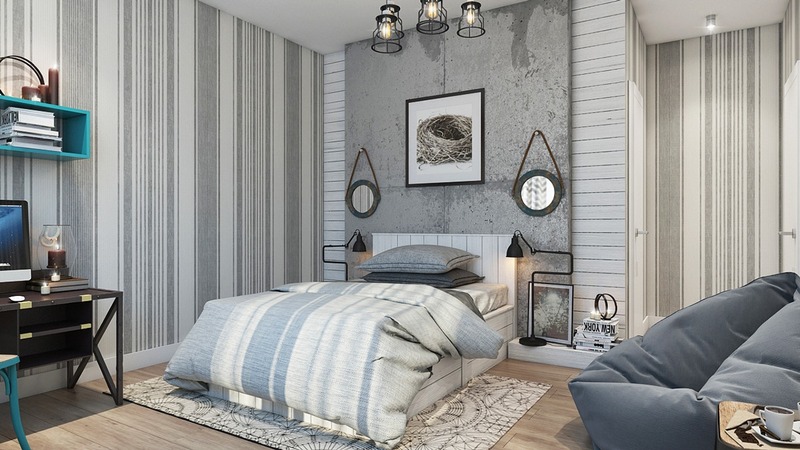 Contemporary stripes, white wooden wall paneling, and soft colors give this bedroom a lot of casual chic appeal. 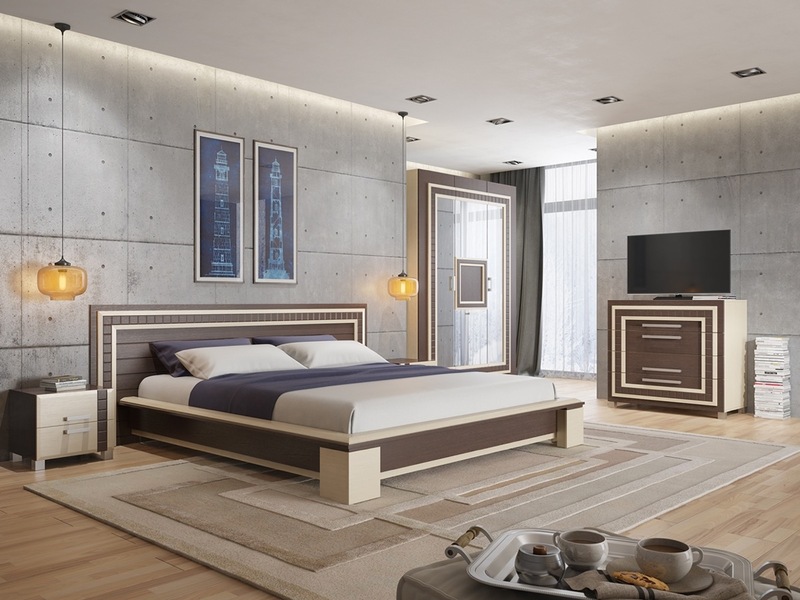 The stunning concrete accent behind the bed is an unexpected and effective way to update the theme for today’s tastes. Now let’s take a look at a few finishing techniques, starting with something quite unique! The decorative herringbone scoring adds an artistic element to the distressed concrete accent wall. 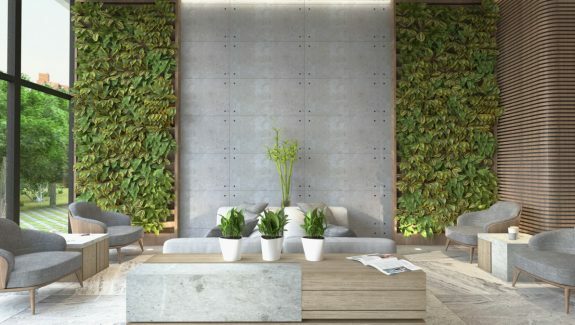 Vertical scores of pocked concrete help create the illusion of wood wall panels with a rugged industrial edge – just one of many ways to bring substantial character to concrete walls. 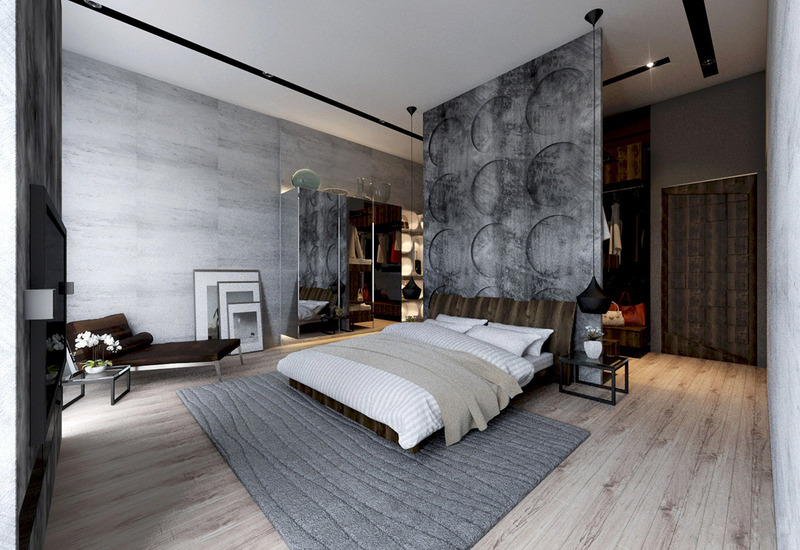 Here’s an example of two concrete finishes in one room. Vertical broom finish makes the walls appear taller, while the ceiling sections alternate for a balanced look. 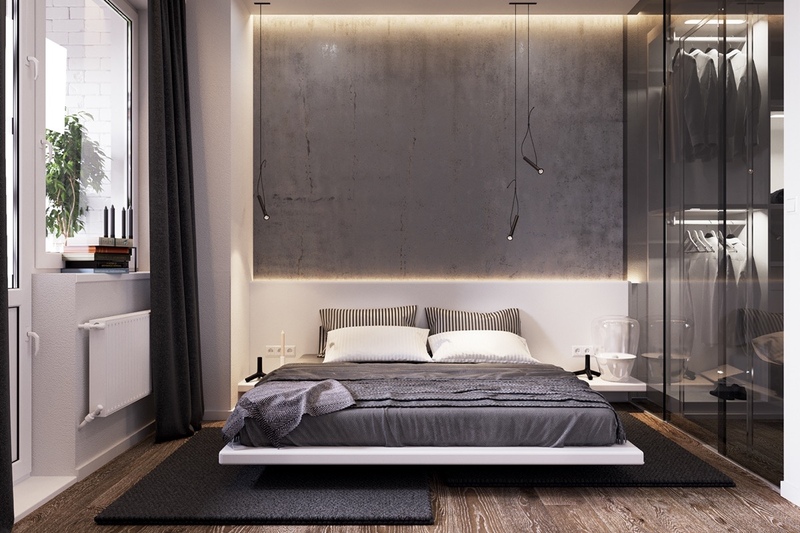 Dark textural finishes are great for sultry minimalist bedrooms like this. 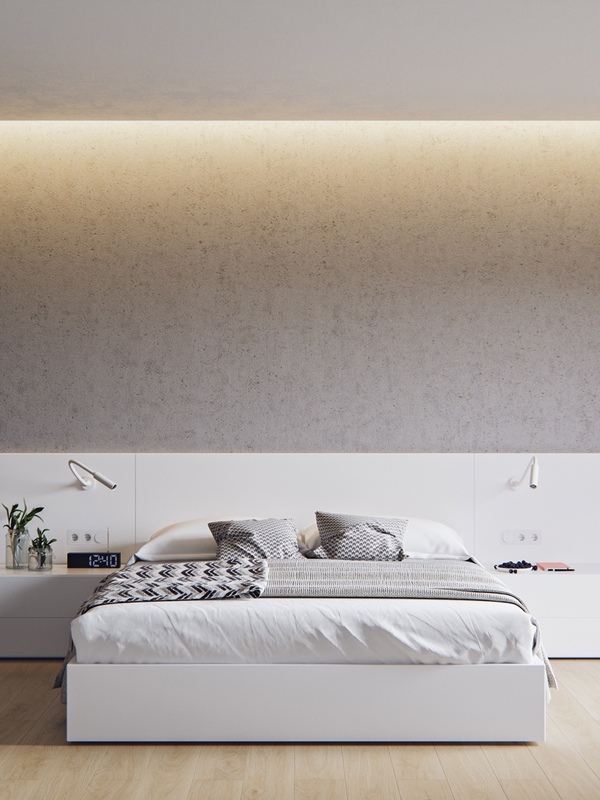 See more minimalist bedrooms – with and without concrete – at our minimalist bedrooms post.